The Cirrus Design SR22GTS is a four-seater aircraft, standard equipped with the Cirrus Airframe Parachute System (CAPS). This safety system lowers the entire aircraft to the ground in extreme emergencies. Top of the Cirrus range is the Cirrus SR22 turbo model in GTS trim, equipped with a enhanced vision system (EVS), a sophisticated dual-wavelength instrument that offers both infrared and synthetic vision. The third-generation Cirrus SR22 GTS, launced at AirVenture 2010, has a 315 hp twin-turbo intercooled Continental TSIO-550-K engine. General Enterprises b.v., the European Distribution Centre of Cirrus Design Corp., is situated at Groningen Airport Eelde in the Netherlands. Over 4400 of the all-composite SR20, SR22 and turbocharged SR22T aircraft are built. On 7 July 2012, Cirrus Design SR22GTS c/n 0350 was registered N281CD with Cirrus Design Corp. On 28 July 2012, the N281CD was registered with Aircraft Partner N117MX DST in Berlin, Germany. On 24 September 2013, registration N281CD was cancelled as exported to Germany and the 2012-built Cirrus Design SR22GTS was registered D-ESBF. On 24 November 2016, the aircraft was noted at the General Enterprise site at Groningen Airport Eelde with registration N10CD in stead of D-ESBF and on 5 January 2017, the aircraft was registered N10CD in the USA with Southern Aircraft Consulty Inc Trustee in the UK. 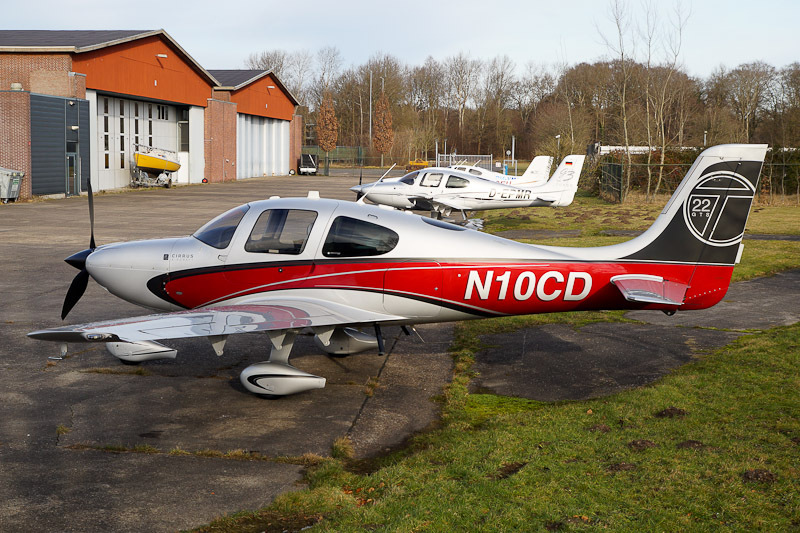 On 28 January 2017, Cirrus Design SR22GTS carbon N10CD was seen at the General Enterprises site at Groningen Airport Eelde.